It’s amazing how sometimes when you look in the fridge, it may seem like there is nothing and yet that is the exact time you will put that nothing together to make something you want to make over and over again. Today the fridge held some brussel sprouts, a cauliflower and a forgotten fennel bulb. This ended up being this rather pale but rather delicious salad. It matched the grey concrete sky out the window and also meant that I could play this while I cooked. 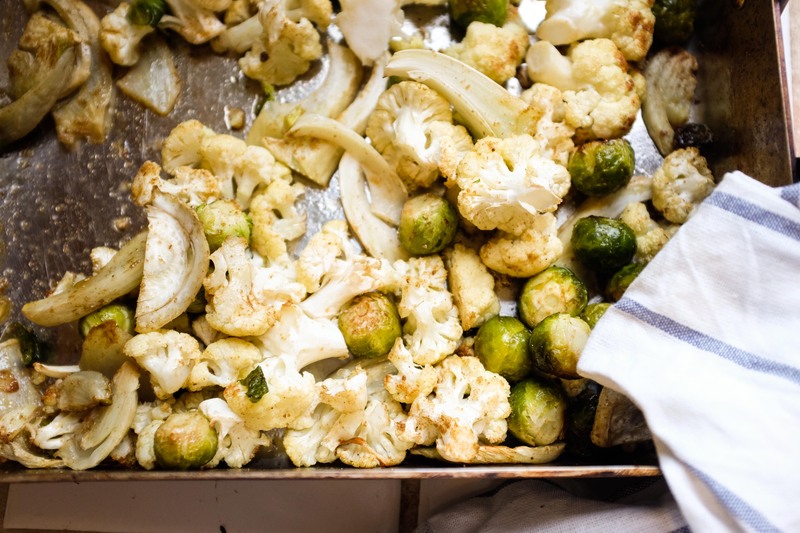 Heat your oven to 200°C while you prepare the brussel sprouts, cauliflower and fennel. Scatter in a roasting dish with plenty of olive oil and the ground cumin. These should take about half an hour to cook, you want them to still have a bite, but the fennel will have started to get lovely and sweet. 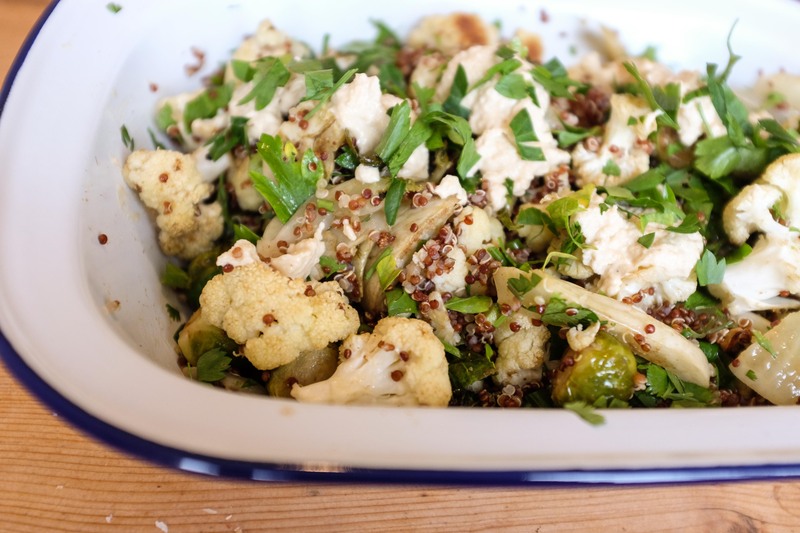 You can cook your quinoa while the vegetables are roasting (half a cup of quinoa to a cup of cold water. Bring to the boil and then simmer until all the water is absorbed). When you pull the vegetables out of the oven, squeeze over the lemon juice and add a generous amount of salt. This will smell delicious and nothing like over boiled, sulphury brussel sprouts from school lunches in England (especially that time when you sat in Alex’s brussel sprouts with mince and mashed potatoes that you then carried round on the back of your school skirt for the afternoon). Mix this in with the quinoa, finely sliced spring onions and the herbs. 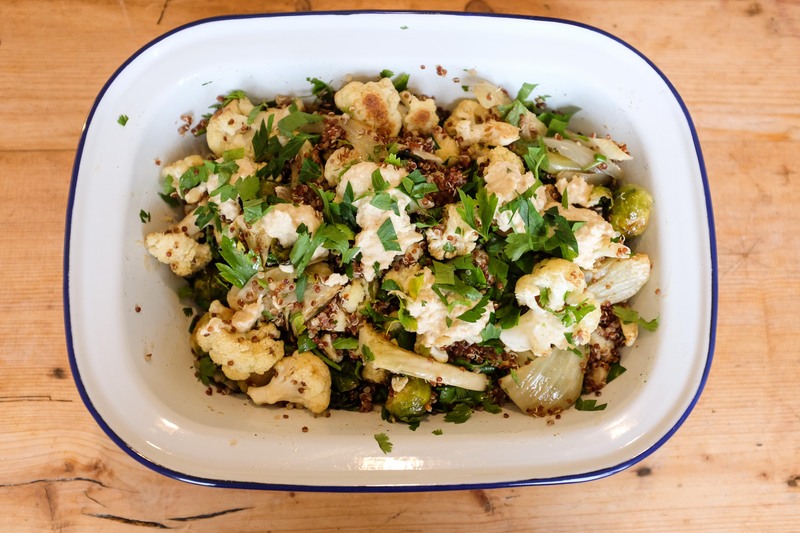 Although it doesn’t add any colour, garnishing with some hummus really completes the sweetness of the fennel, the earthy flavours of the cauliflower and sprouts, the fresh herbs, nutty quinoa and the spicy cumin. Perfect to serve hot with lamb and pita breads, or to put in a container to take for a work lunch when your work has no microwave.